Twenty-five years ago, on 8 December 1987, the Presidents of the United States and Soviet Union met in Washington to sign a breakthrough treaty to eliminate ground-launched US Cruise and Pershing missiles and Soviet SS20s from Europe. This was not just the usual kind of Cold War arms reduction meant to clear out some obsolete nukes and pave the way for new refinements. The 1987 Intermediate-Range Nuclear Forces (INF) Treaty was the first real disarmament agreement of the Cold War, resulting in the withdrawal and destruction of 2,000 landbased US and Soviet missiles with ranges between 300 and 3,000 miles. By 1992, all 96 state-of-the-art cruise missiles were removed from the US Airforce base at Greenham Common, Berkshire, as well as 16 that had just been sited at the Molesworth base near Cambridge. The INF Treaty was finalised in conventional bilateral negotiations, but it reflected deeper political changes and ushered in a very different future than had seemed possible a few years earlier. Among the pressures that brought about this breakthrough disarmament agreement were two kinds of civil society action. Studies by US and Russian scientists that concluded that nuclear war would cause a global “nuclear winter” shocked President Gorbachev into taking the first step; while the US military was being undermined and demoralised by the innovative, persistent, and unquenchable protests of a new generation of women peace activists that grew out of the Greenham Common Women’s Peace Camp. Helping to reframe Europe as our shared home rather than the divided and militarised Cold War blocs, European Nuclear Disarmament (END), ‘people to people’ campaigns and the ‘women to women’ initiatives from Greenham and the Women’s International League for Peace and Freedom (WILPF) crisscrossed the Iron Curtain, journeying by foot, train and bus from Britain, West Germany, Sweden and elsewhere in Western Europe through the Baltic states or East Germany to Poland, Czechoslovakia, and on to Leningrad and Moscow. The new thinking and people-based strategies in the resurgent European peace movement were epitomised by actions begun by a handful of women living in the open rain and mud in front of the main gate of the US Airforce Base at Greenham Common. On December 12, 1982, on the third anniversary of the NATO decision to bring the new US missiles into Europe in a “dual track” strategy that confronted the Soviet Union missiles with a “zero option”, 35,000 women answered our call a to come to Greenham and “Embrace the Base”. Just before dawn on that bitterly cold, sleety Sunday I crawled out of the sagging black plastic “tent” that six of us called home after our own tents and caravans were evicted. Several hundred women from Scotland had arrived in the night and were standing with candles by the gate, gazing in at the nuclear base. Disgorged from hundreds of coaches, thousands of women encircled the whole base, covering its 9 mile perimeter fence with symbols of love – family photos, baby clothes and toys, pictures of the earth and the glories of nature, symbols of peace in Suffragette-coloured ribbons, personal mementos and witty, irreverant posters – and of fear, with strong “Ban the Bomb” messages and many graphic images of nuclear mushroom clouds and the victims from Hiroshima, Nagasaki, and nuclear tests in the Pacific. Men who turned up were directed to Orange Gate at the Eastern end of the runway, where they could help run the creches, first aid, food and warm hospitality marquees catering for less mobile women and children. For many women, “Embrace the Base” was the first time they had ever seen a nuclear base. On the buses back home, many women started plans to set up local Greenham groups. Some 6,000 stayed overnight for Monday’s “Block the Base” in which we filled the roads and entrances with singing women and halted military traffic and construction work for a symbolic day. Though the Women’s Peace Camp had started a year earlier, the mobilising of thousands of women to encircle and then blockade the base in December 1982 really put Greenham on the political map, with international attention and front page coverage in all the British dailies. Other actions followed in swift succession: film footage of 44 women “dancing on the silos” on New Year’s day 1983 was transmitted round the world. Our Suffragette-inspired “rush” on parliament a couple of weeks later led to 70 women being penned up by police for hours after chaining ourselves to various railings and statues inside the Palace of Westminster, with Members of Parliament bringing tea, sandwiches and heartening speeches of support (though others called for us to be put on trial). Women dressed in black were arrrested for “dying in Downing Street” and blocking US Vice President Bush’s car. 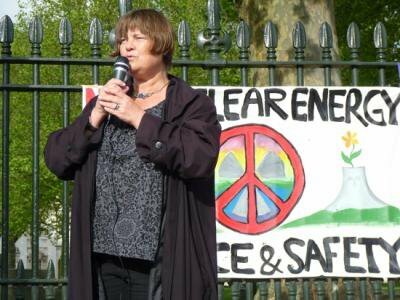 Easter 1983 witnessed a human chain jointly organised with CND, linking Greenham with the UK nuclear bomb factories of Aldermaston and Burghfield along about 15 miles. When the second “Women’s International Day for Disarmament” was coordinated by Greenham and ‘Women for Life on Earth’ on May 24, over a million women around the world responded with rallies, peace camps and actions at bases or local landmarks. We even fielded three candidates in the 1983 General Election (I stood against Defence Secretary Michael Heseltine in Henley). For the June 21 solstice we held a dragon-themed arts festival, and then celebrated July 4 with a week long blockade of all the USAF gates at Greenham, organised this time by Greenham women’s groups in London, hundreds of whom took the week off work to sit in roads and stop military vehicles. Halloween was celebrated by thousands of women who cut the Greenham fences and occupied the runway. And in November, coinciding with the court case taken by thirteen Greenham Women Against Cruise and two US Congressmen in the New York courts, women organised demonstrations at all 102 US bases in the British isles. On Greenham’s side, feminist lawyer Jane Hickman and New York’s Center for Constitutional Rights, while district attorney Rudy Giuliani (who later became NY’s mayor) defended the US President and Joint Chiefs of Staff. We were seeking an injunction to prevent cruise being deployed. But by the time the case went back to Court, the first 16 cruise missiles had been flown into Greenham and installed in the silos that we had previously danced atop. Though disappointed, no-one was surprised. Our legal initiatives and nonviolent direct action were intended to put the military and government authorities under pressure and focus public attention on this new generation of nuclear weapons, but we knew that unless we could change the political context, the US Airforce had the technology and power to fly the first cruise missiles over our heads. Michael Heseltine strategised with the US military, who were authorised to shoot protesters if we got too close to the weapons. In response, on December 13, 1983, 50,000 women again surrounded the Greenham base, while thousands of British and American military were deployed inside the perimeter, their own faces reflecting back at them from thousands of mirrors. The mood was much angrier as we pulled the fences down instead of decorating them. Anger can be necessary and empowering and still nonviolent, if channelled into opening common land and removing shackles and undertaken with care not to harm others. That year ended with Greenham women getting into one of the sensitive military areas that Heseltine had told Parliament we could not reach. On December 27, three of us climbed up the air traffic control tower and suspended a ‘peace on earth’ banner from the top. After getting into the control room, we occupied it for five hours and read classified documents on base procedures in the event of accident or attack involving nuclear, chemical or biological weapons. These were all about saving the US military personnel, with nothing about warning local emergency services or helping the people living near the base. From 1984 – and for the next few years – our challenge was to prevent cruise missile deployment being successful and to keep the feminist, anti-militarism of Greenham growing everywhere, no matter what was used to dislodge us: courts, evictions, imprisonment, vigilante and police violence. The road-based mobility of cruise missiles was their special feature, intended to ‘melt into the countryside’ and fire from phallic tipper trucks called ‘transporter erector launchers’ without being detected. That was the theory. In fact, every nuclear convoy excursion after the first went out in 1984 was tracked, monitored, bannered, photographed, and often stopped and marked with a pink mixture of paint and porridge. This extraordinary feat of monitoring and disruption was carried out by Greenham women in cooperation with ‘Cruisewatch’ , local networks involving concerned people from towns and villages across rural Berkshire, Hampshire and Wiltshire (and beyond). It greatly demoralised the military, as we now know. From the 1982 “Embrace the Base” to the INF Treaty was just five years. In marking these two anniversaries I’ve highlighted only one year’s actions at Greenham, and left out far more of the politics and developments than could be explained in a short article. The British Conservative Party’s narrative that the INF Treaty was the product of “negotiations from strength” is motivated by a political desire to write Greenham women out of history. For obvious reasons! According to a source quoted by former Defence Correspondent, David Fairhall, Margaret Thatcher begged the US not to withdraw from Greenham, because “We can’t let them think they’ve succeeded”. By contrast, US and Russian officials have been quicker to acknowledge the influence of Greenham’s persistence and awareness-raising influence. I was present when President Gorbachev told a Pugwash meeting in London a few years ago that he felt able to take the risk to go to Reykjavik and propose nuclear disarmament not because he trusted President Reagan at the time, but because he trusted that the European peace movement and Greenham Common women would make sure that the US would not be able to take unfair advantage. It is right of course to credit President Gorbachev for taking the courageous step of calling NATO’s bluff and offering to accept the “zero option” and eliminate the landbased missiles from both sides. And to be relieved that President Reagan and some of his more enlightened security officials, such as Secretary of State George Shultz and Max Kampelman, were prepared to go to Reykjavik and discuss Gorbachev’s disarmament initiatives constructively. What we didn’t know then but learned later was how close the Americans and Russians came to nuclear war in 1983. Though the INF Treaty can be counted a success, it was much less than what was possible – and needed. Now we stand on the threshold of another major civil society mobilisation to get rid of nuclear weapons once and for all. The objective is not another partial agreement but a global nuclear ban treaty. Not just another bilateral reduction of the two largest arsenals, but a multilaterally negotiated treaty in which the nuclear-free countries have as much if not more say in what must be done to create security without nuclear weapons. Twenty-five years after the INF Treaty there are nine nuclear-armed states and around 19,000 nuclear weapons. And though George Osborne has been preaching austerity and cutting the budgets for social welfare, health, education and defence, £2 billion are still being squandered on deploying Trident, and up to £100 billion would have to be found to procure Trident’s replacement. With new threats from climate destruction and all the new tools of social media, today’s international campaign to abolish nuclear weapons will look very different from what we’ve seen in the past. But to win it, we will need to build an unstoppable civil society movement across all nations and classes, inspire and focus the creative energies of women and youth again, take nonviolent direct action at the nuclear facilities, revise and update the “nuclear winter” studies, and show leaders what the world would look like if we fail to disarm and nuclear weapons are used again. If we believe we can really ban nuclear weapons this time, then the Greenham experience demonstrates that a lot can be accomplished in a few years!